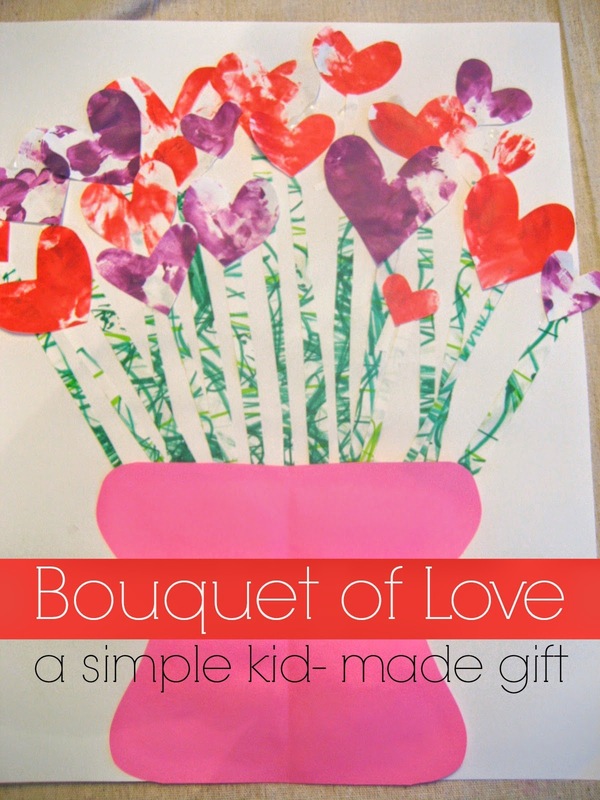 Valentine's Day, Mother's Day, or Father's Day are great times to make simple gifts for those you love! This bouquet of love heart craft is an easy gift idea that will also be a treasured keepsake! Materials Needed: scissors, large drawing paper, acrylic paint (we used green red, and purple), paper plates, markers, and glue. You could easily use washable tempera paint too. bolded materials are the ones not pictured. 1. Pour paint onto paper plates. I used one paper plate per color. We also used one color paint at a time and cleaned up after each color so that we didn't get too much mixing. 2. Encourage your child to cover the large drawing paper with handprints, fingerprints, etc. 3. Switch to the next color and repeat. 4. When we were done we had three papers covered with paint. We let the paint dry overnight (since we did this right before bed). 5. On another piece of large drawing paper, I worked with my son to draw long lines (they would be the flower stems). Mostly he just covered the paper with green marker, which worked perfectly for what we were doing. 6. While your child draws green lines, you can cut hearts out of the painted papers. 7. Next, cut the paper covered in green marker lines into strips to make stems. 8. Have your child help you glue the green strips (stems) in place on the large drawing paper. 10. Draw a vase by making a design on one side of a folded colored piece of paper. 11. Cut the vase out. 12. Glue the vase on top of the stems. 13. Let the picture dry and then write a message to a friend on the vase... or just hang up the beautiful bouquet of love in your house! My toddler wasn't too helpful with the gluing/cutting this project required... but he LOVED the painting and drawing parts, so that kept him occupied while I cut and glued. Older kids could probably glue, cut, and place the pieces of this project independently. This project would also be a great way to teach symmetry to older kids... since you use principles of symmetry to cut the hearts and the vase. We worked on practicing saying "I love you!" while we made this project. We also talked about sizes since the hearts and strips of paper were cut to be big and small. Trying to expand language a bit by saying, "big red heart" instead of just "big heart" was fun. We also talked about thick lines and big dots when my son was drawing lines and other shapes with the markers to make stems. Need another great gift idea? How about trying our Kid Made Sandpaper Printed Towels? I LOVE this idea! Think we're going to try it today! Just got the supplies ready to do this tomorrow morning. Thanks! What a darling craft!! I love it! My daughter is home from Kindergarten today (snow day) and we made two of these this morning. They are so cute and easy. She has leftover pieces and is going to make something else with them. Thank you for the craft idea!! My daughter is home from Kindergarten today (snow day) and we made two of these this morning. She loved cutting out the shapes and seeing what parts of the paint design were on them. She has some leftover pieces and already is planning something else to make with them. Thank you for the great idea! !